thoughts & happenings: Rockhampton Caravan Show. 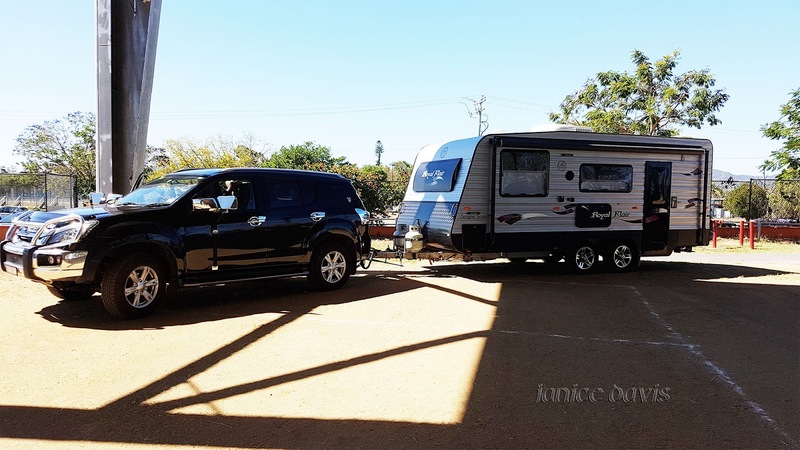 Whilst parked at the caravan park in Rockhampton in winter 2017 a man and a women approached us asking if we would like to have our vehicle and caravan weighted by the Queensland Transport people at the showgrounds the next morning. Appointment was made we passed with flying colours, weights were excellent and we had room for more luggage or whatever if we wanted. 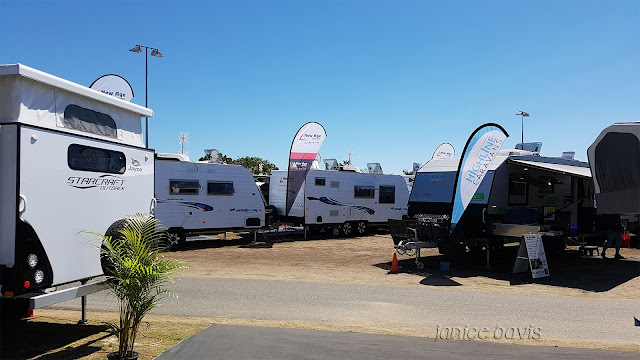 A couple of the transport men asked if we would care to look at the caravan show and if so we could park as in the photo below for free - of course we were so pleased as there was no parking outside, so off we went and had a wonderful day looking at new caravans. 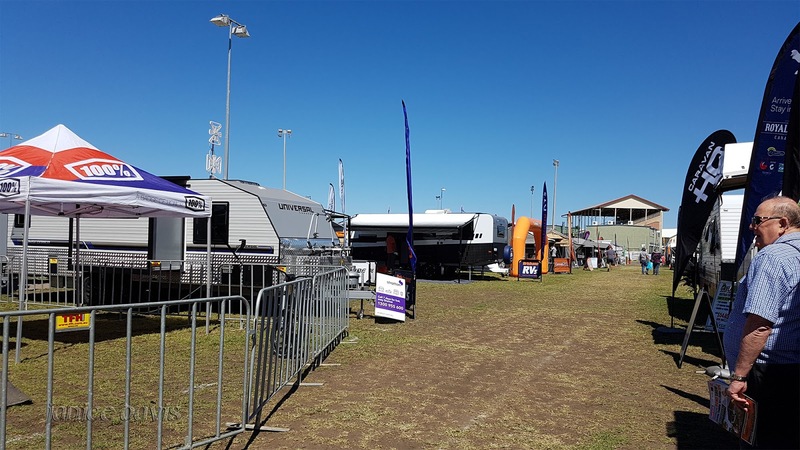 The show was massive with many streets within the showgrounds caravan's covering them. Sign to show us where some of the places are in Australia - noted Cradle Mountain which is in Tasmania's north. For those that do not know, it's in Tasmania's north that we live, though some distance from Cradle Mountain. 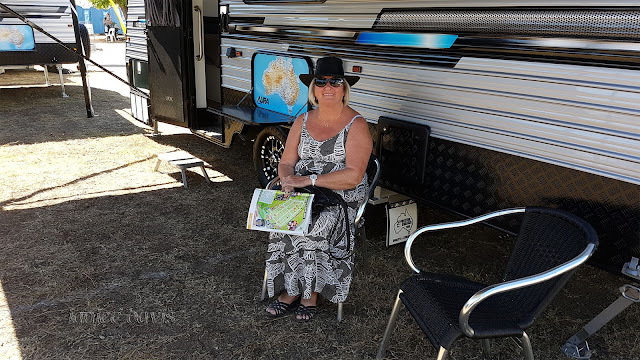 Always pleasant to have a rest during walking around the caravan show. Wonderful to see so many luxury caravans. Nice to see you enjoying a quiet moment. Certainly was trying to have a quiet moment on a borrowed seat, it was good to rest. 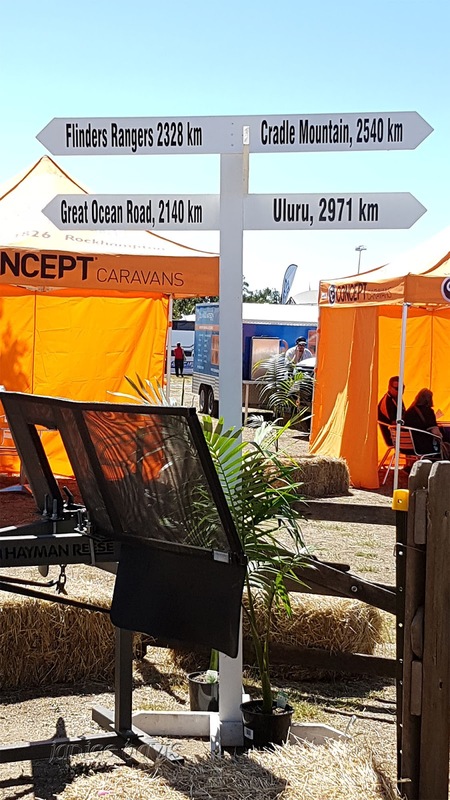 I think that your own caravan looks the smartest of them all. Thank you Rosemary - you will get on :). I think our own caravan looks ok too! Una vez instalado, hay que tomar un tiempo de descanso y así reponerse de las muchas horas de viaje. Was a very long way to walk so a rest was good thing to be able to have. An enjoyable day, I'm sure. It was John, we had never been to one before. Just as well yours is quite new, otherwise there might be much temptation. I think your van looks better because of the way colour has been used. Although caravaning doesn't seem to be for us, I love looking at them and discovering clever innovations, along with how every centimetre of space is used. 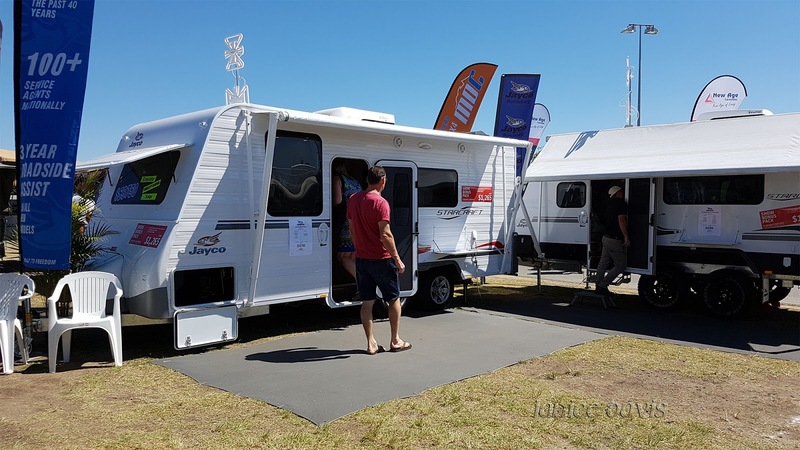 You will get on Andrew re our caravan looks nicer :) and you are right saying ours was fairly new so therefore not tempted to buy another. Caravaning is not for everyone - we like both travelling to motels/apartments and staying put plus caravaning. That must have been a great show. A well deserved rest, for sure. Certainly was a good rest after what seemed walking for miles/klms. Your caravan is the nicest I think. I don't think I'd make a good caravanner, I like a lot of space around me. Caravaning is not for everyone - it is a small place inside but if it's open plan it's not too bad, plus we do sit outside a lot in the shade. It is good that they were offering free weight checks... and that you passed with flying colours. That would be very re-assuring. My husband always wondered how the weight was in the caravan so he was certainly tickled pink when all was good. Nice one, caravans circling. Really good photos. You are not wrong on that. It's going to be very hot in Rocky this week...The Berserker Range will be stopping the slightest of sea breezes from getting through. Oh gosh yes, 41 deg I see - now that's hot. great show and this is nice that you enjoyed it alot . loved the last one having your lovely smile ! it seems that Australia has less mountainous areas right?